Farm Description and Practices Nestled in Deming, WA, Williams Farm has a rich history that goes back to 1894 when Harry Williams’ great grandparents first homesteaded there. 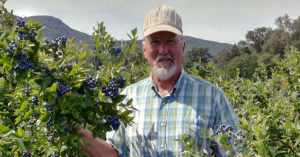 Since 1975 we have been growing and handpicking the sweetest blueberries. Today, we harvest 13 varieties across 40 acres in the lush foothills of Mount Baker. Certifications GAP. AIB Good Management Practices for food warehousing.